In Danny Phantom, Sam Manson is one of Danny’s best friends. She’s a less dreary version of a goth, and very outspoken about recycling and not eating anything with a face. Sam likes to wear black and purple goth outfits, but will change things up, even wearing a pink princess gown or orange jumpsuit from time to time. 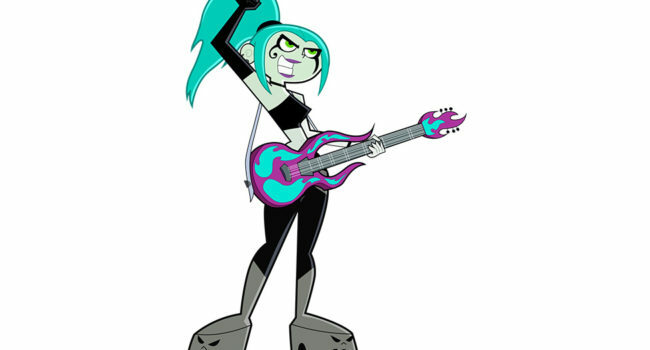 In Danny Phantom, Ember McLain is a hard-rocking ghost teen who disrespects any and all authority figures. She views Danny Phantom as her arch enemy and blames him for ruining her vocal cords. She has full control of her trademark blue flaming hair, which she can use as a fire attack or shape however she likes. Danny Fenton was a 14 year old boy, who had ghost hunting parents. His parents had built a machine that led into the Ghost Zone, which was an alternate dimension of Earth, where ghosts roam free. There are many dimensions inside of the Ghost Zone, of course, all which have a door that leads to another portal, either back into the ghost zone, or to the next dimension. His parents, Jack and Maddie Fenton, thought the machine didn’t work until Danny “looked” inside of it, tripped, and became our beloved, Danny Phantom.